A note to say how satisfied we have been with Mike’s Pest Control: We started with Mike’s Pest Control several years ago and were impressed with courtesy and professionalism of the entire staff. Last year we began lawn treatment with Mike’s Pest Control and have been very satisfied with the service. Oh yes, prices are very favorable when compared to the competition. I have been dealing with Mike’s Pest Control from the beginning of them coming to McAlester. They have performed many jobs for me, from building inspections, mole extermination and lawn spraying. I would highly recommend them to anyone who has a need for their services. 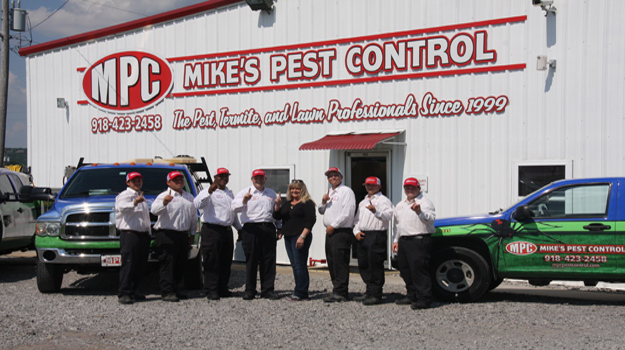 Mike’s Pest Control is honest, dependable and has integrity. I have done business with Mike’s Pest Control for several years at multiple locations. The staff is always friendly, professional,and reliable. They respond quickly to your needs. I have always had good results with Mike’s Pest Control. Before using Mike’s Pest Control lawn service my lawn was filled with weeds and very patchy. Since they are treating my lawn on a schedule, it is lush, green and devoid of weeds. My neighbours are envious and always asking why I only mow once a week and they have to mow so much more. I refer them to Mike’s Pest Control for the best in lawn service. I have used Mike’s Pest Control for several years now. Not only are they the best for pests in my home, they are absolutely the best for weed control. I have the best looking lawn in my area . No weeds means I mow less and I have a deep green lawn.